It may come as a surprise that Green & Black’s was not named after a ‘Mr. Green’ and a ‘Mrs. Black’, in fact it was founded by Craig Sams and Josephine Fairley after Craig was sent a sample of 70% dark chocolate made from organic cocoa beans and they just had to share it with the rest of the world. The ‘Green’ in the name symbolises the company’s strict organic principles while ‘Black’ represents the intensity of the chocolate. Upon a trip to Belize Craig & Jo heard of a group of Mayan smallholder farmers who had been asked to plant cocoa trees by a large chocolate company that had since pulled out of the country, leaving the farmers with no market for their cocoa beans. This is where Green & Black’s came in, buying the cocoa from these farmers at a fair price and creating their first chocolate bar – Maya Gold – inspired by the traditional spiced Mayan chocolate drink. Not only was the bar a hit, it was also awarded the first Fairtrade Mark for a chocolate product in 1994 – a huge achievement. Green & Black’s buy Trinitario cocoa beans, one of three types of beans produced around the world. The Trinitario beans are full with dynamic flavour and once they have been hand harvested they are left to ferment under banana leaves before drying out in the sun. Green & Black’s believe that organic farmers are much more interested and invested in the quality and taste of what they are producing which is why pesticides and harmful chemicals are never used in growing the beans. To safeguard against diseases, the beans are grown in the shade of the rainforest alongside crops like avocado, pineapple, coffee and banana which encourage the natural biodiversity. Green & Blacks have been buying cocoa beans from the Toledo Cacao Growers Association farmers cooperative since 1994 allowing the farmers to benefit from rises in cocoa prices while offering security if the market price falls. The company also has a five year rolling contract with the cooperative and continue to heavily invest in the cocoa growing community allowing the farmers to plan for the future of their families and the community, including education for their children. In 2003 Green & Black’s started their Belize Program which saw a considerable amount of money invested over three years – matched by a grant from the government of the Dominican Republic – to improve management and farming practices, rehabilitate hurricane damaged crops, plant over 1million more cocoa trees and train farmers in better growing methods. If you’re looking for a brand of chocolate that is committed to ethical trading then Green & Blacks is the one to choose, with Ethical Sourcing Standards based on Internationals Labour Organisation Conventions, the UN Declaration of Human Rights, the Ethical Initiative Basecode while taking into account the Soil Association Organic Standards. 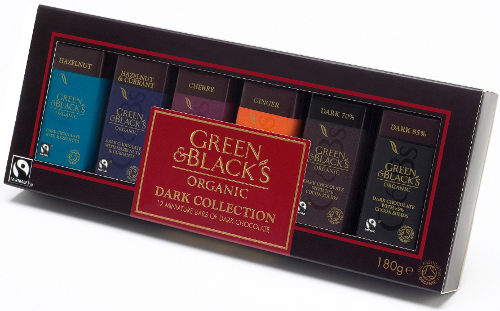 The company expects suppliers, co-manufacturers and business partners to follow ethical standards because respect for human rights, ethical trading, organics and the environment are right at the heart of Green & Blacks. For Fairtrade Fortnight 2020 you’ll be able to get 20% off all the original Fairtrade Maya Gold chocolate bar from Green & Black’s!